Sphaera has expertise in the design of bespoke CBT for avionics training for both commercial and military aircraft. We also provide an expanding range of COTS aircraft instrumentation and avionics training products. Most of these products can be purchased online now by visiting our products list or, for more information, contact us. 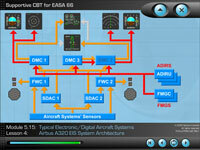 Airbus A320 CBT covering the EFIS and the ECAM system architecture.